Chester Court is a handsome product of the 1920s transformation of the Upper West Side into a neighborhood of major apartment houses. 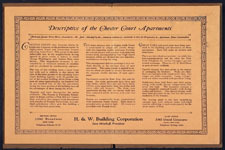 Designed by famed apartment-house expert Emery Roth for developer Sam Minskoff, Chester Court combines a solid, economical, efficient plan with Italian Renaissance-inspired ornament, including some remarkably beautiful multi-colored glazed terra-cotta on its façade, and a handsome lobby including elaborate Adamesque plasterwork on its ceiling. Roth was one of New York’s most prolific designers of hotels and apartment buildings of the 1920s and ‘30s, including some of the best-known names: the San Remo, the Eldorado, the Ritz, the Beresford, the Normandy. 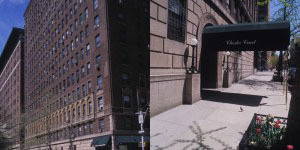 Though his buildings can be found all over the city, Roth has always been especially associated with the Upper West Side.